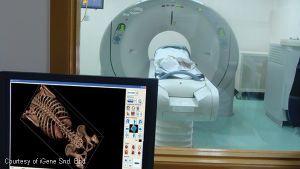 iGene® has developed iDASS™ software that employs images from medical imaging modalities, mostly CT scanner, to produce a 3D digital body for forensic autopsy. iDASS is the first application in the forensic domain that enables pathologists to investigate the body without physically manipulating it. 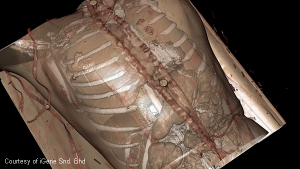 There are different tools available in this application to help pathologists perform a successful autopsy like Auto Metal Tracking (AMT) which helps users scan the 3D body and locate any metal particles inside. Other tools help examine internal bleeding (e.g. due to stab wound), and extract body organs like the heart, kidneys, eyeballs, lungs, etc., for detailed examination. 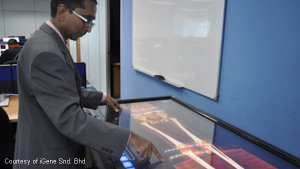 3D and 2D views of the digital body. Digital image processing like auto-metal tracking is provided in our software. In addition, iDASS can be easily integrated to our forensic information system, INFOPSY™. Another point is its important role in multimedia reporting where snapshots and videos from iDASS can become part of the final autopsy report to be presented in court. Open Inventor and its VolumeViz extension have been used for the past 6 years to power iDASS’ successive versions and iDASSmart (an extended version of iDASS). The advantages of using Open Inventor are its performance and wide range of capabilities as compared to other SDKs (software development kits) which are not as sophisticated. Currently, Open Inventor achieves the best performance when rendering 3D images. The technical support provided by FEI Visualization Sciences Group is good and the level of responsiveness to our inquiries is quick, which is very important to us. We are looking forward to using in even greater depth Open Inventor’s vast range of capabilities through dedicated training to our development team. Our aim is to continue using Open Inventor to add analytical functionalities to iDASS and more digital image processing features. iGene Sdn. Bhd. specializes in the development of Advanced Medical Visualization Technology. The company is based in Kuala Lumpur, Malaysia. iGene Sdn. Bhd. operates as a subsidiary of INFOVALLEY Group of Companies.models of material structures. Open Inventor is a leading platform for developers of all types of medical software, for cloud, desktop and mobile environments: 2D and 3D imaging, PACS, image processing and analysis, diagnosis and surgical planning, device modeling and 3D printing, simulation and training. The Open Inventor object-oriented API is designed to quickly integrate powerful new visualization and analysis capabilities into software applications in a simple and consistent way. Images and text are courtesy of iGene®. ↑ Dr. Pramod Bagali conducts a 3D digital autopsy derived from 64-slice CT. Thickness of slices ranges from 0.625 mm to 0.9 mm. ↑ 3D volume rendering of internal organs of a cadaver inside a body bag.